Thank goodness Santa’s elves found us and gave us this special letter. Justin The Artistic Horse was invited to Dixon, IL. for a painting demonstration downtown in front of The Next Picture Show Art Gallery. That was Justin’s first urban painting experience and he handled everything like a pro. The precious little girl, Danielle, watched Justin paint all day. When he finished painting Danielle and Justin posed for this photo, Justin nuzzled her hair like they were best friends. 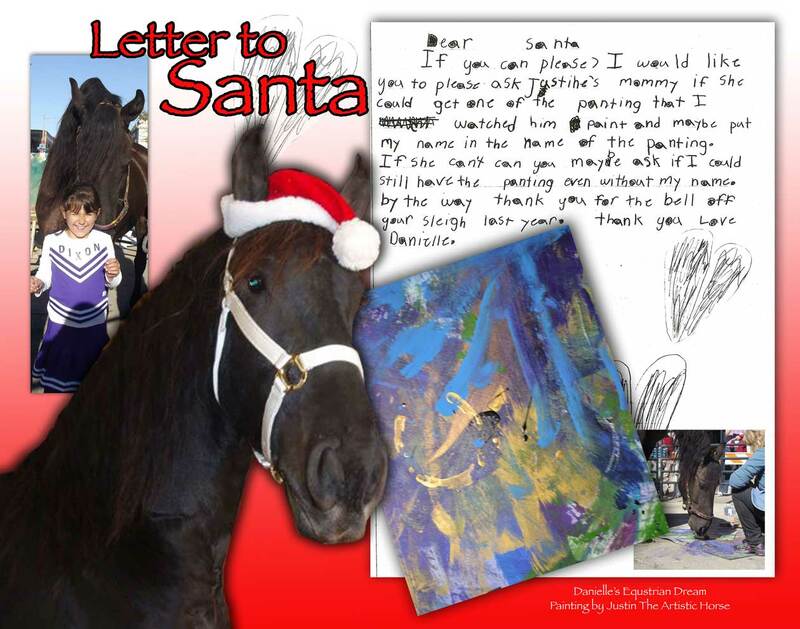 The letter was sent air mail just in time for the elves to find Justin and deliver the painting to Danielle for Christmas. She could have asked Santa for an ‘i toy’ of some sort but instead she asked for this original painting that she watched as it was created. Justin is thrilled that the painting belongs to her now it is titled “Danielle’s Equestrian Dream”. Click here to see Justin’s available paintings.